The Fantastic Four have been through a lot lately. Their comic got cancelled. They’ve seemingly gone their own separate ways in Marvel’s upcoming continuity reboot. Their movie really, really sucked. Like, really sucked! Anything else would be just kicking them while they’re down. So let’s get kicking! Yes, the Baxter Building, the on-and-off home of the Fantastic Four since they moved in in 1962’s Fantastic Four #3, is no longer occupied by Marvel’s first family. And who’s moving in? None other than Peter Parker himself. The information comes from a batch of comic solicitations Marvel released for November of this year—by which point their “All-New, All-Different” universe will be well under way. The premise of The Amazing Spider-Man #3 (Alex Ross’ cover for which you can see above) sees Parker, who is now the head of bigshot tech company Parker Industries—and has been for a while in the recent comics—sees P.I. move into the vacated Baxter Building as their expanded New York office. As you can see above, at least one of the former Fantastic Four, Johnny Storm, is a bit miffed that Spider-Man is moving in on the FF’s long-standing digs. In a way, it makes sense—while there’s been no comment on the Fantastic Four as a unit since Marvel canned their series earlier this year, we do know that they’re split up for the foreseeable future in the new comics reboot. Johnny himself has joined the Inhumans, The Thing is now a Guardian of the Galaxy, and poor Mr. Fantastic and Invisible Woman are... well, nowhere to be found. 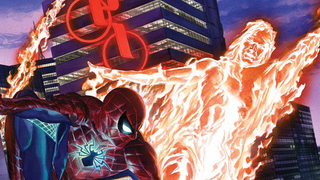 The Fantastic Four can’t really occupy the Baxter Building in the state they’re currently in, so Peter Parker’s packing his bags and moving in. It’s a move that certainly makes it seem like, whatever happens to the Fantastic Four, they won’t be part of the new status quo for quite a while. Well, at least until after Fantastic Four comes out on blu-ray. You know how it goes.